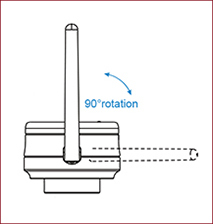 The SKYE WiFi Microscopy Camera is offered by Meyer Instruments, Inc. The new SKYE WiFi Microscopy Camera Series delivers fantastic color images and video without the need for cumbersome cables or bulky computers by the microscope. SKYE WiFi microscopy cameras set a new standard for convenience and collaboration in color microscopy imaging. The ACCU-SCOPE® SKYE WiFi microscopy camera brings researchers and educators a new level of convenience and flexibility across a broad range of microscopy imaging applications for documentation, analysis, education and collaboration. 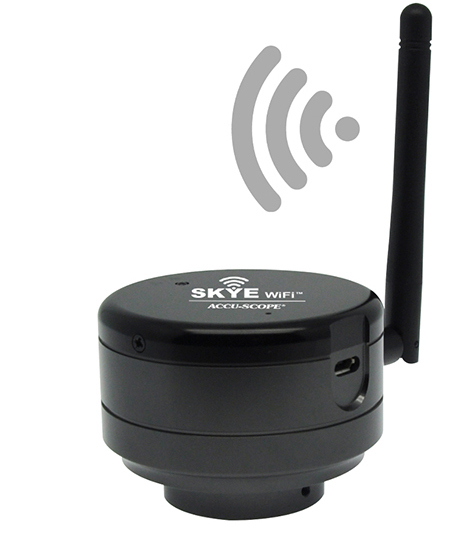 Speak with one of our specialists today to see if an ACCU-SCOPE SKYE WiFi Microscopy Camera is right for you! 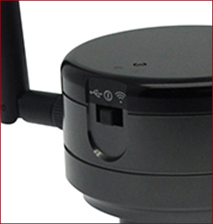 Transmits its own 2.4GHz signal to wirelessly transfer images to your WiFi-connected computer or mobile device. WiFi is switchable with a USB 2.0 connection. View the live image at an amazing 40 frames per second (at 1280×960 resolution). Simultaneously view live images on up to 10 computers, tablets, or cell phones. Easily upgrade to any microscope. 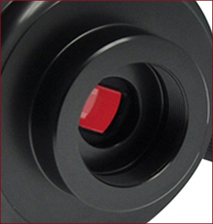 Attach the AU-500-WIFI to any camera port or eyepiece tube with a c-mount adapter. Simultaneously view live images on multiple devices! Capture snapshots or videos with click of a button. Great for everyday specimen observation, instruction and collaboration.